Seasonal produce is always a treat, and whether spring is simply ushering in a new growing season or allowing the earth to regenerate after a snowy, frozen winter, it adds an element of excitement for food lovers. Fresh spring fruits and vegetables are about more than just eating; they symbolize a fresh start, renewal, and, for those who live in colder climates, access to a lifestyle that’s been dormant for months! For many, spring seasonal eating provides an opportunity to avoid imports and enjoy something produced locally. Of course, the availability of spring season food depends on where you live. In North America, spring vegetables like artichoke will be growing in California, while in Ontario, Canada, you would be seeing more beets and potatoes. Either way, spring season foods are a true delight. Variety: When you have the opportunity to eat fresh, seasonal food, it offers natural variety to your diet. It’s very easy—especially with globalization—to go to the grocery store and pick up the exact same items every trip. Focusing on seasonally grown produce adds nutrition and variety you may otherwise lack. Reduced carbon footprint: If you’re buying “fresh” out-of-season produce at the grocery store, it’s likely coming from somewhere far away. Those red seedless grapes you’re enjoying in the winter are coming from Chile, for example. That means they are trucked, flown, then trucked again to get onto your store shelves. They are also likely warehoused along the way, meaning they’ve got a much larger carbon footprint than the locally grown produce you may have picked up from a farm down the street. Potential for additional nutrition: The moment fruits and vegetables are harvested, they’ve had their lifeline cut off. They are no longer receiving nutrients to fuel growth, and essentially begin to die. They can stay alive during shipping with a little extra chemical intervention, however (not exactly appetizing). Therefore, the longer it takes to get to you, the less nutrition it is likely to have. With fresh foods picked and sold within hours, you simply won’t have this problem. All of that said, unless you’re picking your fresh fruits and veggies and eating them almost instantly, frozen fruits and veggies likely pack the most nutritional punch—but they leave a much bigger carbon footprint. More for your money: Fresh produce will likely cost less because you can purchase it directly from the source. It will also have a longer life than food that has traveled across the country, continent, or world to reach you. You’re also supporting your local economy. Before we get started on some of the seasonal specialties ushered in by spring, it’s important to remember the diversity of the North American climate and landscape. If some of the following items are not spring foods in your region, they are somewhere across the continent! Californians can enjoy peak artichoke season between March and May. Virtually every commercially available artichoke is grown in California, and largely in the Monterey County area. So, if you live around the region, you’re likely seeing them available at roadside stands. Native to the Mediterranean, artichokes are a member of the thistle tribe of the sunflower —or Compositae—family. Although these plants fully grow to about six feet in diameter and three or four feet tall, the “vegetable” people eat is actually the plant’s flower bud. Artichokes are a good source of vitamin C, potassium, and folate (B9), which can all contribute to some health benefits. Potassium plays an important role in blood pressure, heart health, muscle strength, and digestion. You can enjoy artichokes by boiling them for 20 minutes, and then peeling and eating the leaves. Dipping it in garlic-infused olive oil can add even more healthy flavor! Spring is asparagus season for nearly the entire continent. While some areas may start seeing the crop in March, others may watch it rise in April or May, with peak season going into June. Regardless of where you are, you’re likely not too far away from some fresh asparagus this season. Fresh asparagus looks and tastes so much better than what’s available over the winter, and it truly is a seasonal treat. It lends itself well to grilling or roasting, and mixing it up with some olive oil, butter, garlic, almond shavings or peppers can add even more flavor. Its spring and summer versatility is one of its biggest assets. Another massive asset asparagus carries is nutritional value. It’s a dense source of vitamin K, as well as a host of other vitamins and minerals. Asparagus promotes healthy digestion, bone health, cellular integrity, and heart health. Apricots are fruits that can grow across the continent, although the varieties may differ between regions and points in the season. For example, apricot season in California starts in early-mid May, while up the coast in British Columbia, you’re more likely to see them in June. This is also true in the east, where they also can grow in June. These beautiful orange fruits can add some color and flavor to meals and sauces, or as a snack on their own, and come packing a real nutritious punch. They are a rich source of beta-carotene, which can help maintain eyesight and fight against inflammation. Because they are so sweet, apricots are super-versatile. They can be sliced up and added to salad, grilled and tossed on some ice cream, or even thinly sliced and baked into crisps. Beets are another seasonal specialty that can be found coast to coast during spring. They’re in growing season, and start showing up at farmer’s markets, in June in the more northern areas and much earlier in Southern climates. In fact, they are always in season in California! Beets can offer a number of unique health benefits, and contribute to lower blood pressure, improved circulation, and overall heart health. Beets can also help control inflammation and promote digestive health. There are countless ways to include beets in your springtime meal plan, and they can be as diverse as juicing them or blending them into smoothies, julienning to add color and flavor to a salad, or even roasting as a side or hamburger topping! Peak season for radish runs from March until June, and the edible root vegetables can add different textures and flavors to your favorite dishes with their versatility. Radishes are rich in the antioxidant vitamin C, which can help protect against environmental toxins and cell damage that lead to premature aging. There is also some evidence showing that the radish—and particularly the leaves—contains compounds that can eliminate certain cancer cells. Radishes can be added raw to salads, sandwiches, and burgers to provide a bit of a crispy crunch, while you can also roast them. Spinach is a cool weather crop that kicks off its growing season in April and can last all year. But even though it is an all-year crop, spring really has the ideal weather for it. Furthermore, it can help usher in the season of fresh, healthy, leafy greens! When it comes to nutrition, spinach—along with other leafy greens—really can’t be beat. Popeye wasn’t wrong: spinach makes your body strong. It can help maintain and improve eye health, fight oxidative stress on your cells (anti-aging), reduce blood pressure, and potentially help prevent cancer. Spinach can be enjoyed in a variety of ways: it can be used as the leafy green in a salad, tossed into a smoothie, or sautéed with garlic. Strawberries can also be grown year-round, but their peak “fresh season” runs from April to June. Personally, I love picking up some fresh strawberries when I get out of the city and head to the countryside. Strawberries aren’t just shaped like your heart, they are good for it, too. They can help increase “good” HDL cholesterol and lower blood pressure. They are also filled with antioxidants and have a very high fiber content—as well as being a great source of vitamins and minerals. Moreover, one serving (about eight strawberries) supplies more vitamin C than an orange! Sliced strawberries taste great with fresh mint, and they can also be included in a number of salads or desserts, including a strawberry crisp. So now you’ve got a nice, colorful set of options lined up for spring eating—and as good as these items are on their own, they’re even better when they’re combined into a healthy recipe. Leftovers for days! 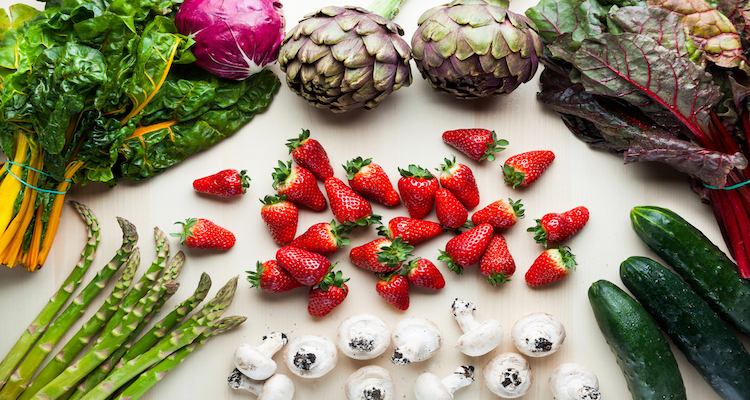 Let’s take a look at a couple of meal options for your seasonal spring produce. Wash asparagus and broccoli, and set aside. Prepare the dressing by whisking together chopped shallot, lemon juice, olive oil, and salt. Stir in pine nuts and set aside. Add a tablespoon of olive oil and salt to a sauté pan and warm over medium-high heat. When hot, add asparagus and broccoli. Toss well and cover, sautéing for one minute. Stir again and taste. If needed, cover and cook for another minute. You want bright-colored greens with a bit of crunch. When cooked, remove from heat. Add radish and lemon zest, and stir. Toss with one-third of pine nut dressing, add more as needed. Fill up three-quarters of a medium-sized bowl with cold water. Slice the lemon in half, squeezing the juice into the water. Toss in the rind. Using a knife, remove the top third of an artichoke. Then slice off the stem to form a flattened base. Peel off the small leaves around the bottom, and using scissors, clip off the tips of the remaining leaves. Use your thumbs to stretch open the center of the artichoke, pulling out the inner yellow leaves. Remove purple choke, and scrape out the fibrous hairs with a grapefruit spoon. Transfer to the bowl of lemon water and repeat with the other artichoke. In a medium-sized bowl, mix together lemon juice, oil, mint, and garlic. Add a pinch of salt. Let it sit for a few minutes to soften the mint. Add the ricotta, saffron, and lemon zest in a small bowl, and whisk together. Season with salt and pepper to taste. Whisk in the egg, then spoon in ricotta into the artichoke center. Put the artichokes in a baking dish with a rim. Drizzle the oil-mint mixture over the artichokes, filling and outer leaves included. Add a splash of water into the baking dish and cover tightly. Roast the artichokes for 90 minutes. The flesh should be very tender and the ricotta, firm and double its original size. Let cool and serve warm. Peel off the leaves and dip the fleshy part into the pan juice. When you reach the center, use a fork to cut into the ricotta and artichoke heart. When you buy local seasonal produce, it does a few things: supports local business, reduces carbon footprints, and gets you excited for and involved in the season. With so many benefits and options, eating spring fruits and vegetables can be the perfect way to usher in the warmer temperatures. Enjoy the tastes of your community! Rider, E., “Top 10 Healthy Spring Foods & How to Use Them,” Elizabeth Rider; https://www.elizabethrider.com/top-10-healthy-spring-foods-how-to-use-them/,last accessed April 5, 2019. “10 Delicious Spring Fruits And Vegetables And How To Cook Them,” Paleo Leap, https://paleoleap.com/10-spring-fruits-vegetables/, last accessed April 5, 2019. Moody, L., “Spring Is Here! Here’s What’s In Season (And Exactly What To Do With It),” Mind Body Green; https://www.mindbodygreen.com/0-29468/spring-is-here-heres-whats-in-season-and-exactly-what-to-do-with-it.html, last accessed April 5, 2019. “Spring: Ontario In-Season Fruits and Vegetables,” GreenBelt Fresh, May 24, 2016; https://www.greenbeltfresh.ca/news/spring-ontario-season-fruits-vegetables, last accessed April 5, 2019. “What’s In Season,” B.C. Farmer’s Markets, 2019; https://bcfarmersmarket.org/why-bc-farmers-markets/whats-in-season/, last accessed April 5, 2019. “The California Artichoke —Official Vegetable of Monterey,” California Artichoke Advisory Board, 2019; http://artichokes.org/recipes-and-such, last accessed April 5, 2019. Bouzari, A., et al., “Vitamin retention in eight fruits and vegetables: a comparison of refrigerated and frozen storage,” Journal of Agricultural and Food Chemistry, Jan. 2015; 63(3):957-62; https://www.ncbi.nlm.nih.gov/pubmed/25526594, last accessed April 5, 2019.
https://www.webmd.com/diet/features/nutritional-benefits-of-the-strawberry, last accessed April 5, 2019. Butler, N., “Are Radishes Good For You?” Healthline, May 17, 2016; https://www.healthline.com/health/food-nutrition/the-benefits-of-radishes#1, last accessed April 5, 2019. Gunnars, K., “Spinach 101: Nutrition Facts and Health Benefits,” Healthline, October 3, 2015; https://www.healthline.com/nutrition/foods/spinach#section2, last accessed April 5, 2019. Heidi, “Asparagus Salad Recipe,” 101 Cookbooks, May 24, 2009; https://www.101cookbooks.com/archives/asparagus-salad-recipe.html, last accessed April 5, 2019. Williams, K., “Roasted Stuffed Artichokes with Mint Oil from ‘The New Persian Kitchen,’” Serious Eats; https://www.seriouseats.com/recipes/2013/04/roasted-stuffed-artichokes-with-mint-oil-from.html, last accessed April 5, 2019.